paneer tikka masala recipe | paneer tikka gravy restaurant style | paneer tikka sabji with detailed photo and video recipe. 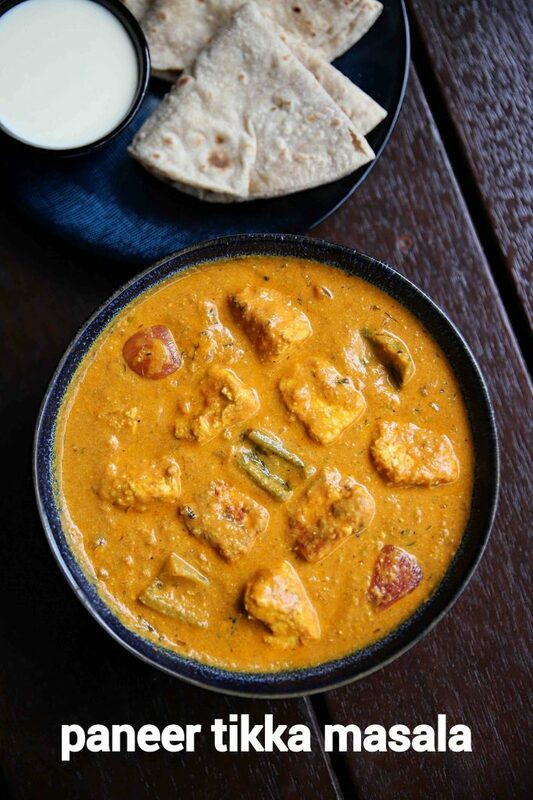 a popular spicy and creamy north indian gravy recipe made with marinated paneer cubes. the recipe of paneer tikka is very inherited from the meat counterpart of chicken tikka masala for veggie lovers. 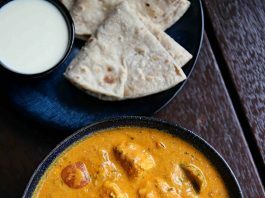 the gravy is rich, creamy and spicy and hence can be used for any type of indian roti or flat breads including naan bread. paneer tikka masala recipe | paneer tikka gravy restaurant style | paneer tikka sabji with step by step photo and video recipe. 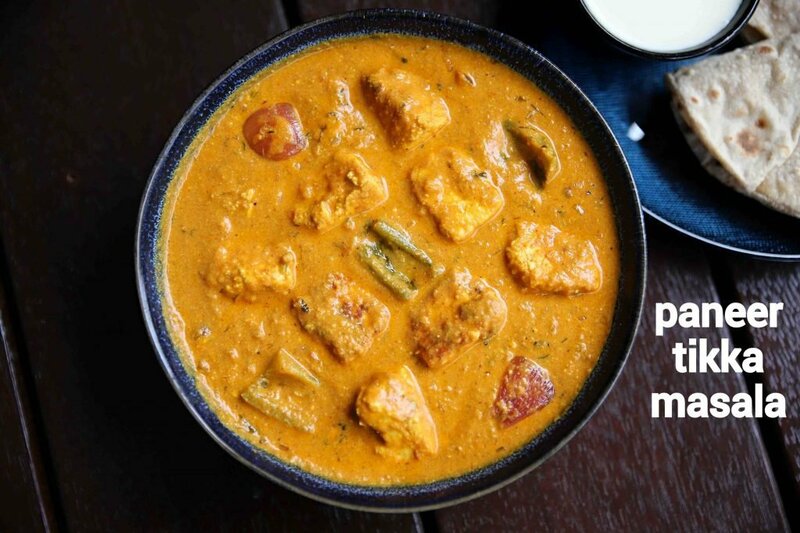 paneer recipes are the most liked gravy recipes across india. perhaps it is one of the most sought curry recipes across both veg and non-veg lovers. it comes with myriad variations with different ingredients. 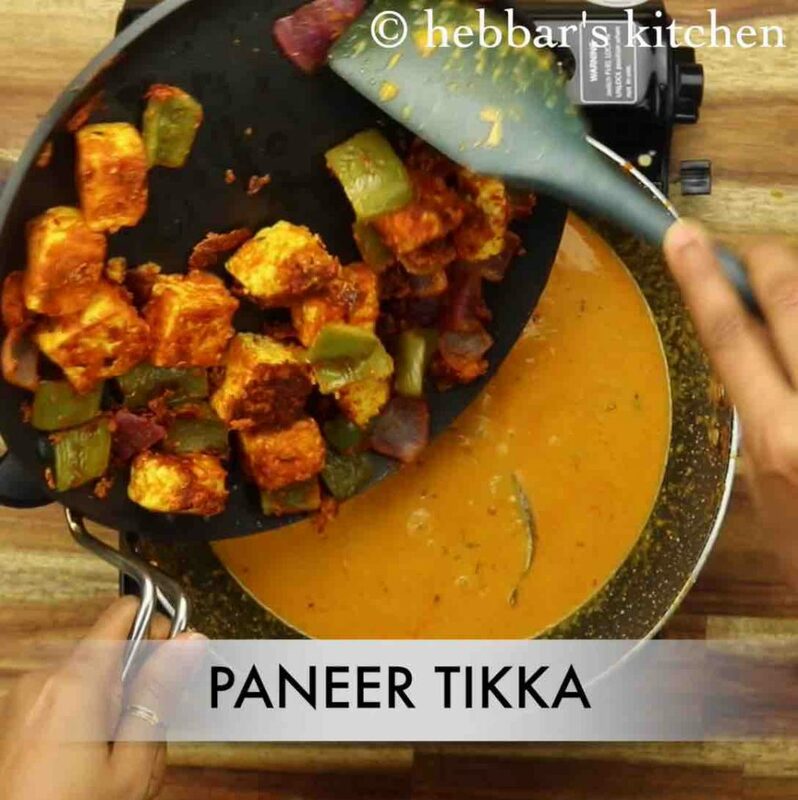 one such popular paneer gravy recipe is paneer tikka masala known for its spicy and creamy taste. 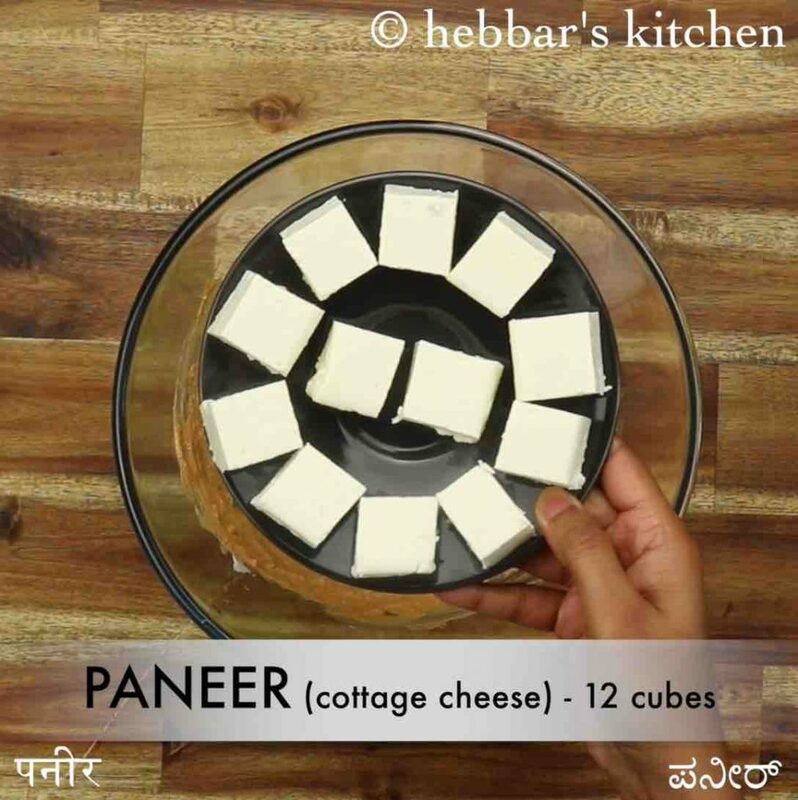 i have posted quite a few paneer recipes and this is my personal favourite along with kadai paneer recipe. basically, i like the medium spicy paneer recipes and both of them offer mostly the same taste and spice level. the other curries like shahi or makhani recipe are more of creamy and rich filled with cream. and hence i particularly avoid it as my tastebuds crave for something in between. having said that, preparing the tikka and making the gravy can be overwhelming for someone who needs something very quick. but i have a quick solution for this, as i make these paneer tikkas as a starter and while i make it, i make sure to make it in excess. and with the leftover, i prepare this curry and hence i can get 2 dishes with the almost same effort. furthermore, i would like to add some tips, suggestions and variations to the paneer tikka masala recipe. firstly, i always recommend using moist and fresh paneer for any paneer recipes including this paneer tikka. i have used homemade fresh paneer, but you can use fresh store-bought paneer too. secondly, i have made these tikka on tawa which should be handy for those who do not have oven or traditional tandoor. but if you have a baking oven, you can bake these in oven at 180 degree celcius for 150 minutes using a skewer. 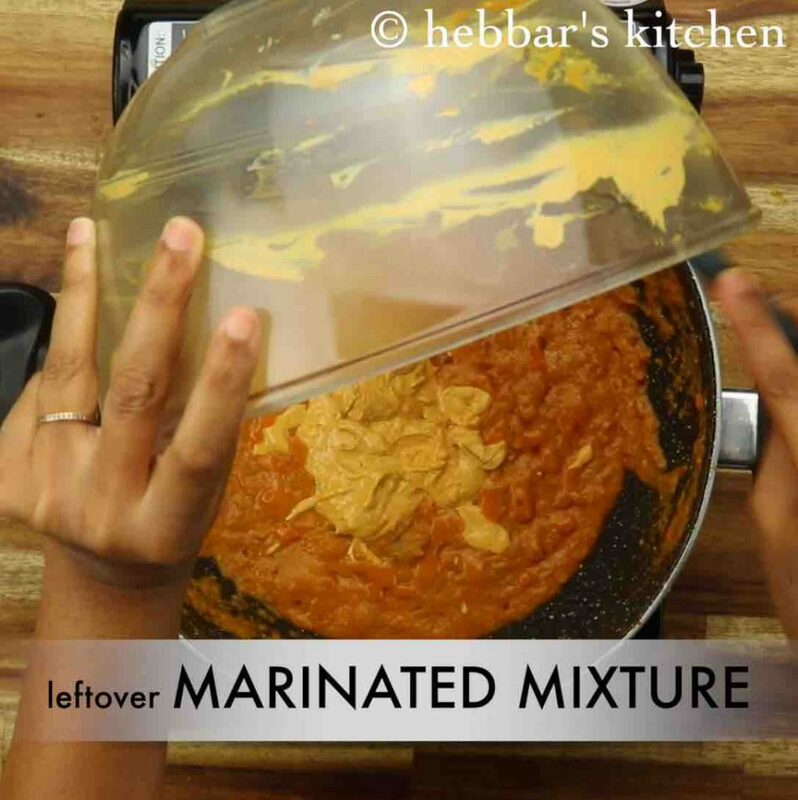 lastly, while marinating, you can keep it either at room temperature or even refrigerate it. i would heavily recommend to refrigerate it for a better result. firstly, in a large kadai heat 2 tsp butter and saute 1 bay leaf. now add 1 onion, 1 tsp ginger garlic paste and saute until it turns golden brown. further, add spice powder and ½ tsp salt. 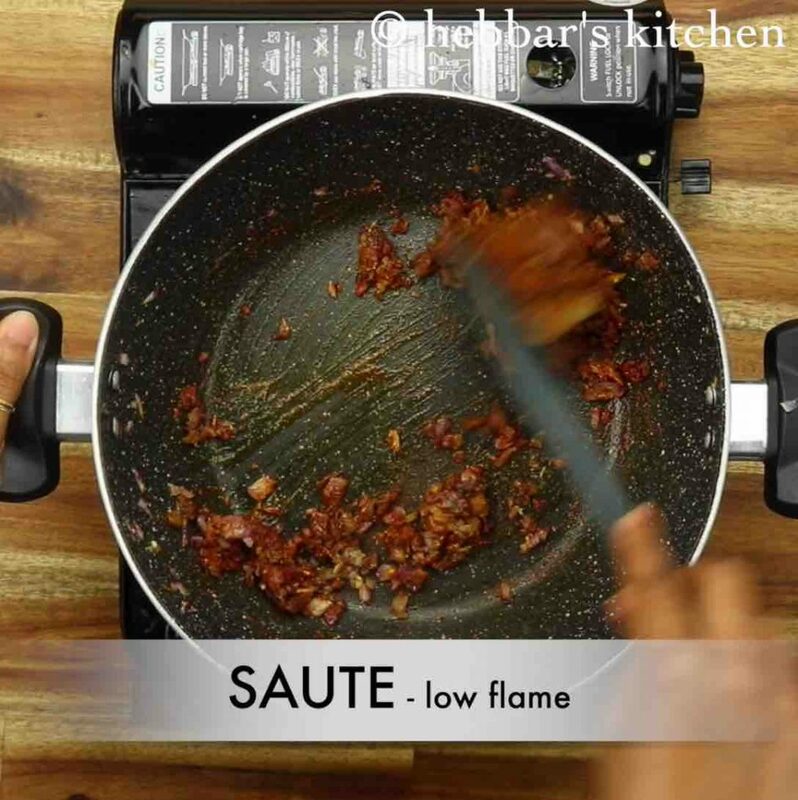 saute on low flame until it turns aromatic. 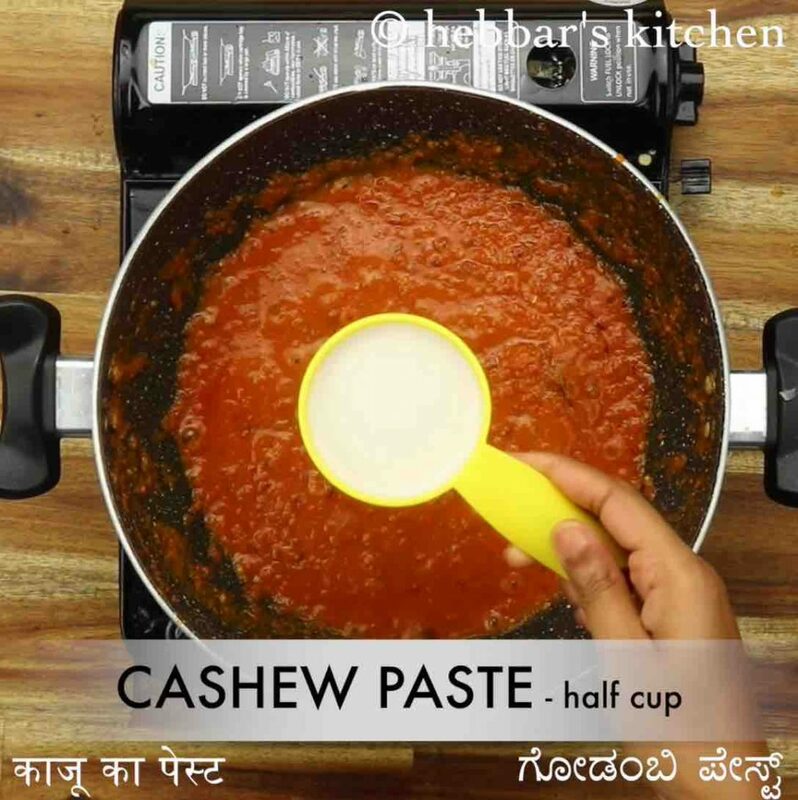 now add 1 cup tomato puree and ½ cup cashew paste and continue to saute. add in the leftover marinated mixture and mix well. further, add 1 cup water and mix well adjusting consistency as required. now add in prepared paneer tikka and mix well. 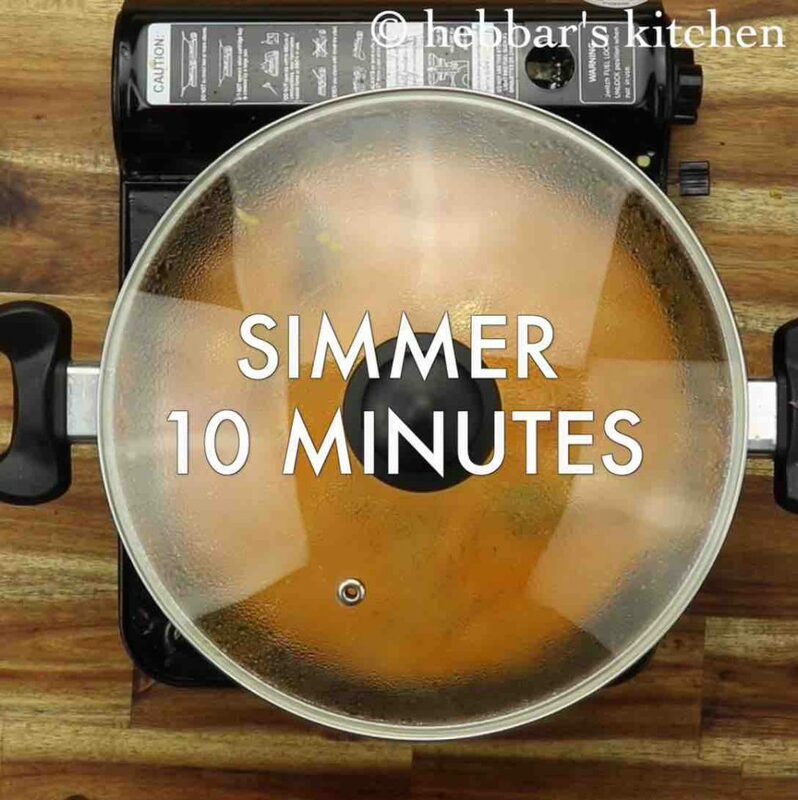 cover and simmer for 10 minutes or until the flavours are absorbed. add in 2 tbsp coriander and 1 tsp kasuri methi. finally, enjoy paneer tikka masala recipe with tandoori roti. firstly, in a large mixing bowl take ¾ cup curd. 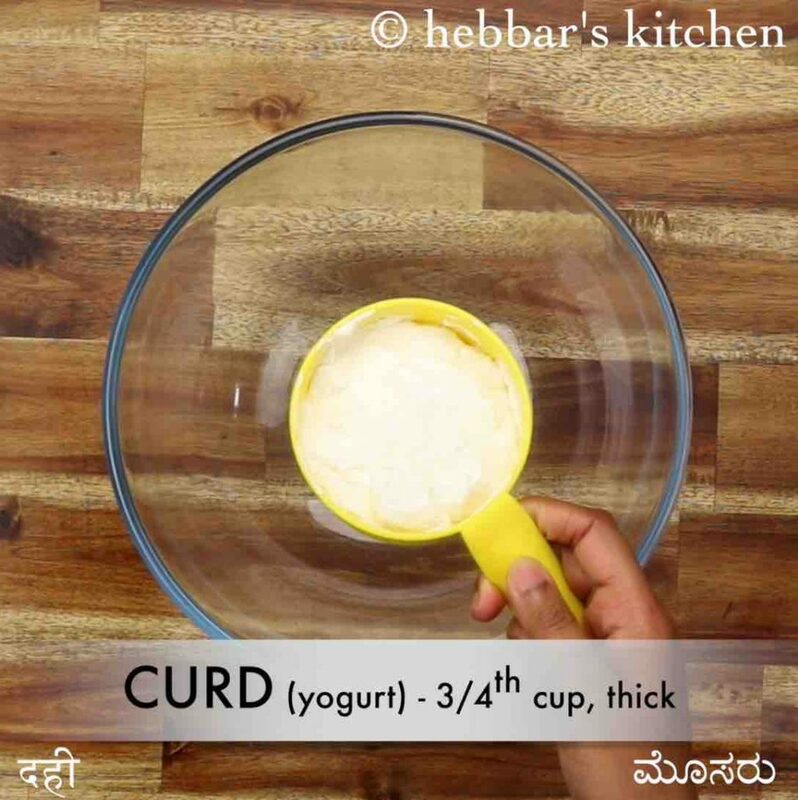 use hung curd or fresh thick curd. 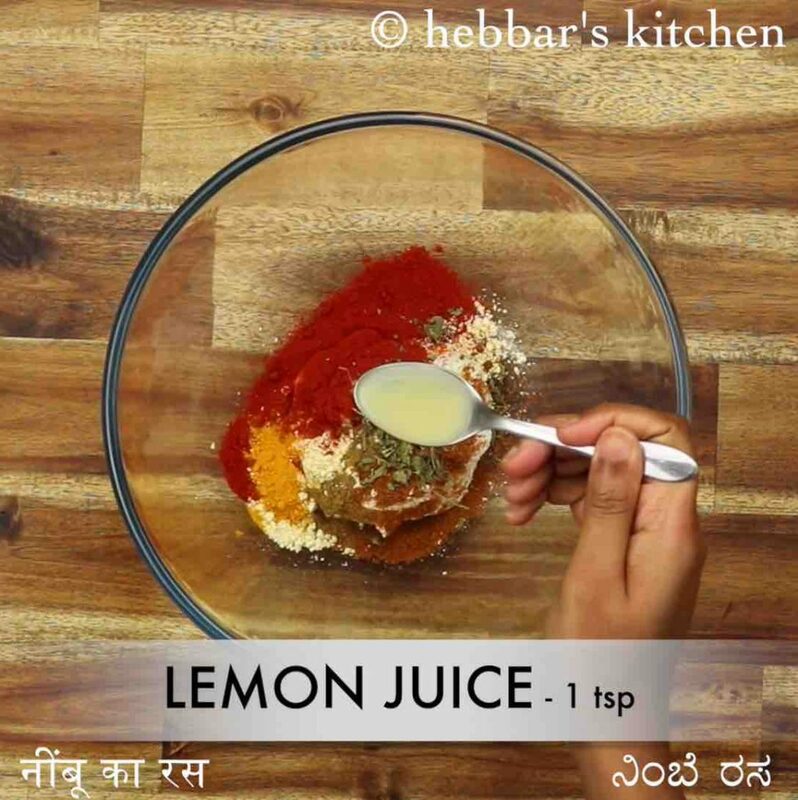 add 1 tsp besan, 1 tsp ginger garlic paste, 1 tsp chilli powder, ¼ tsp turmeric, ¼ tsp cumin powder, ½ tsp garam masala and 1 tsp kasuri methi. 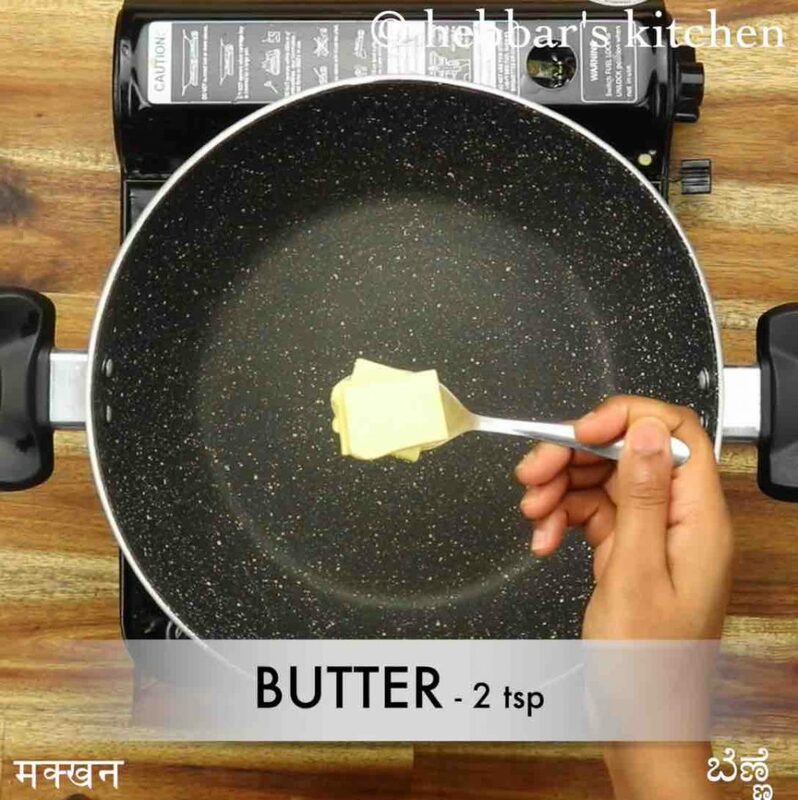 also add 1 tsp lemon juice, 1 tsp oil and ½ tsp salt. 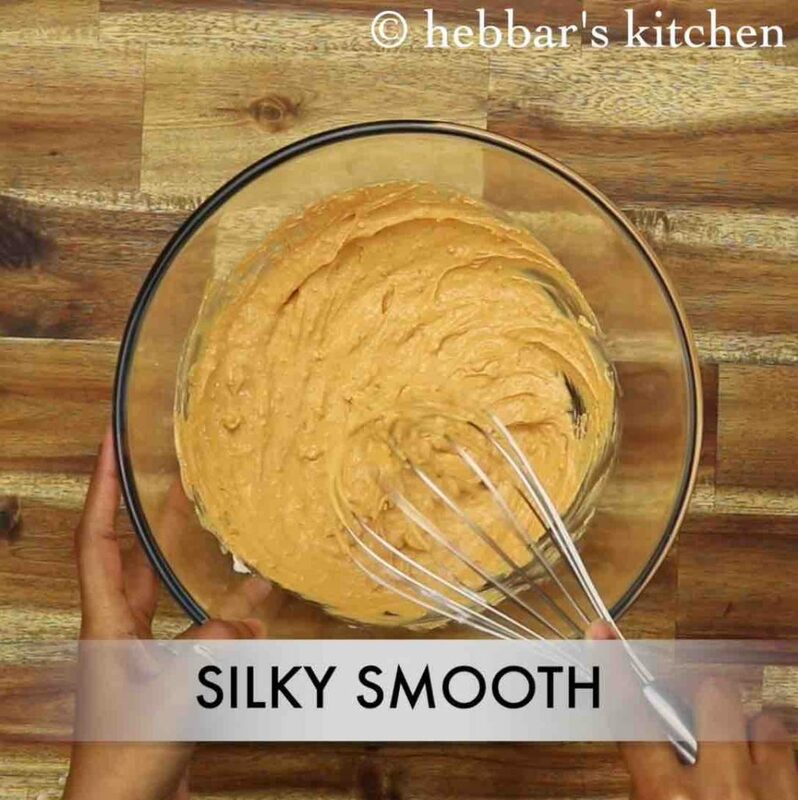 whisk and mix well until it turns creamy. now add ½ capsicum, ½ onion and 12 cubes paneer. 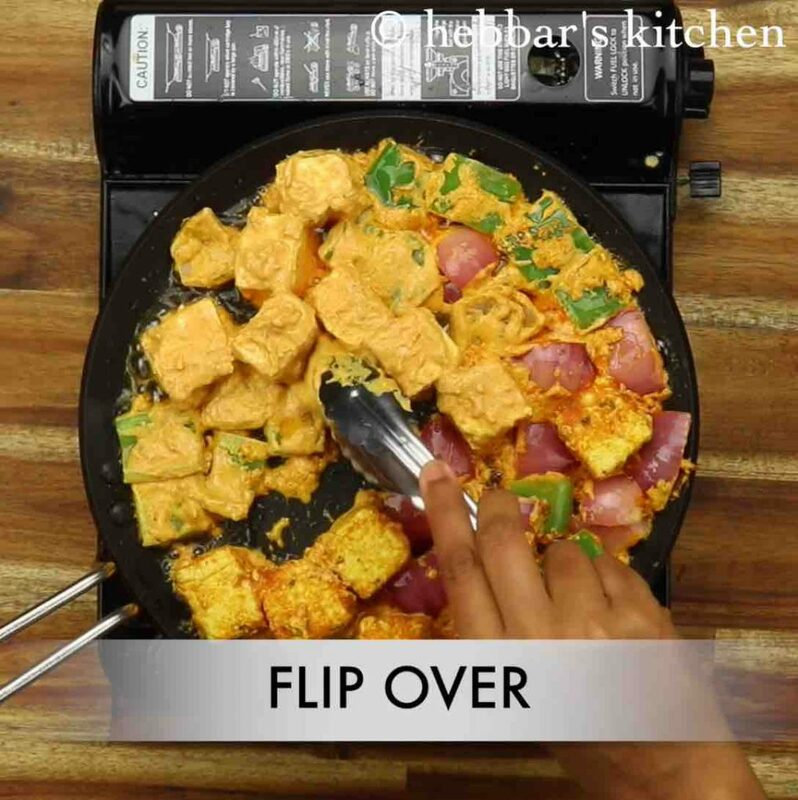 mix gently without breaking paneer. 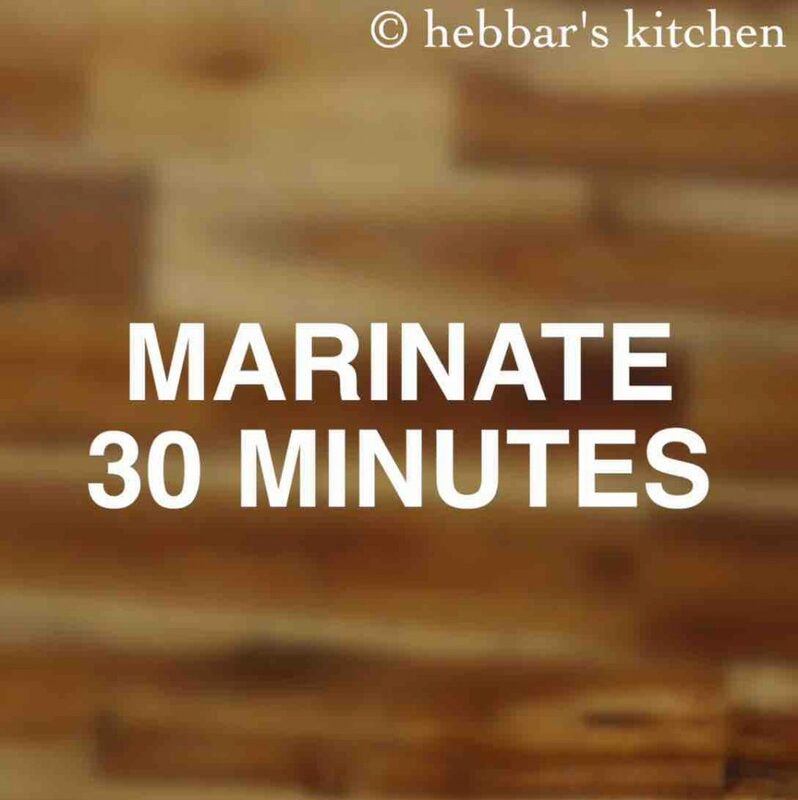 cover and marinate for 30 minutes. 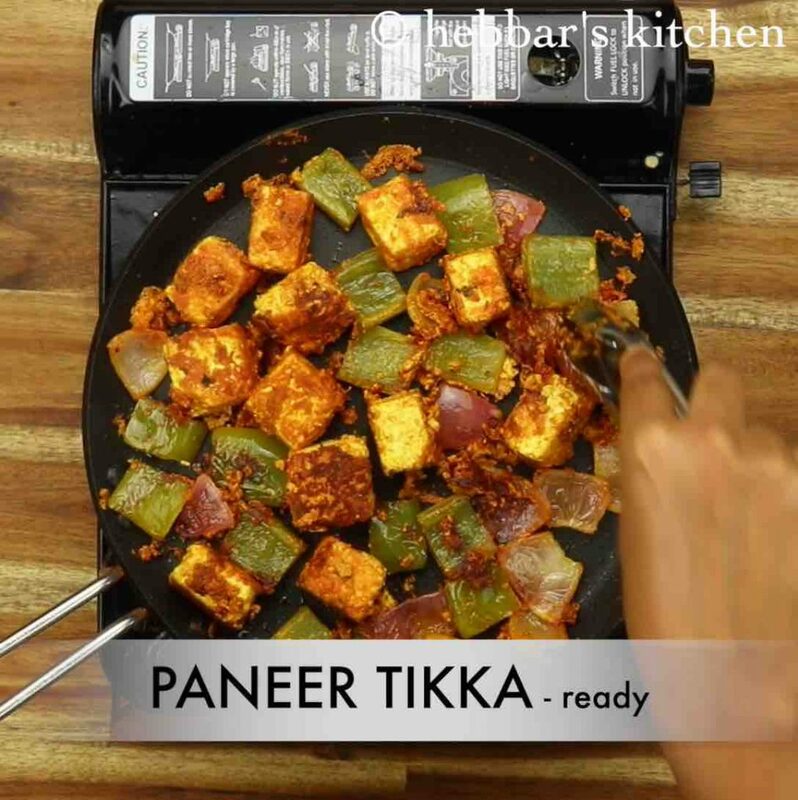 add 2 tsp oil and roast the paneer on medium flame until it turns golden brown. flip over and cook till it turns golden brown. paneer tikka is ready. keep aside. 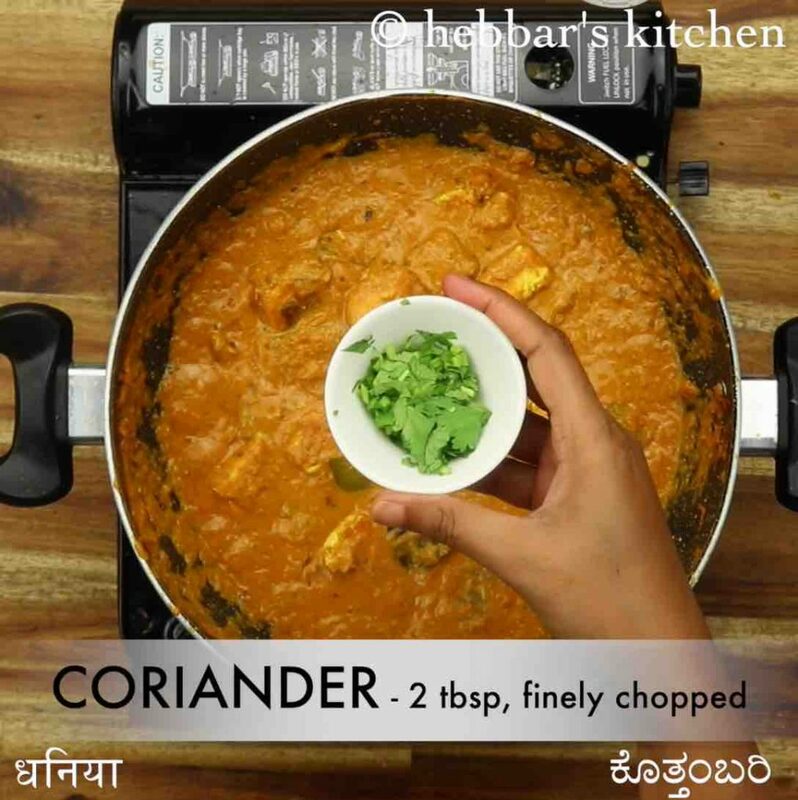 further, add ¼ tsp turmeric, 1 tsp chilli powder, ½ tsp coriander powder, ¼ tsp cumin powder, ¼ tsp garam masala and ½ tsp salt. now add 1 cup tomato puree and saute well. 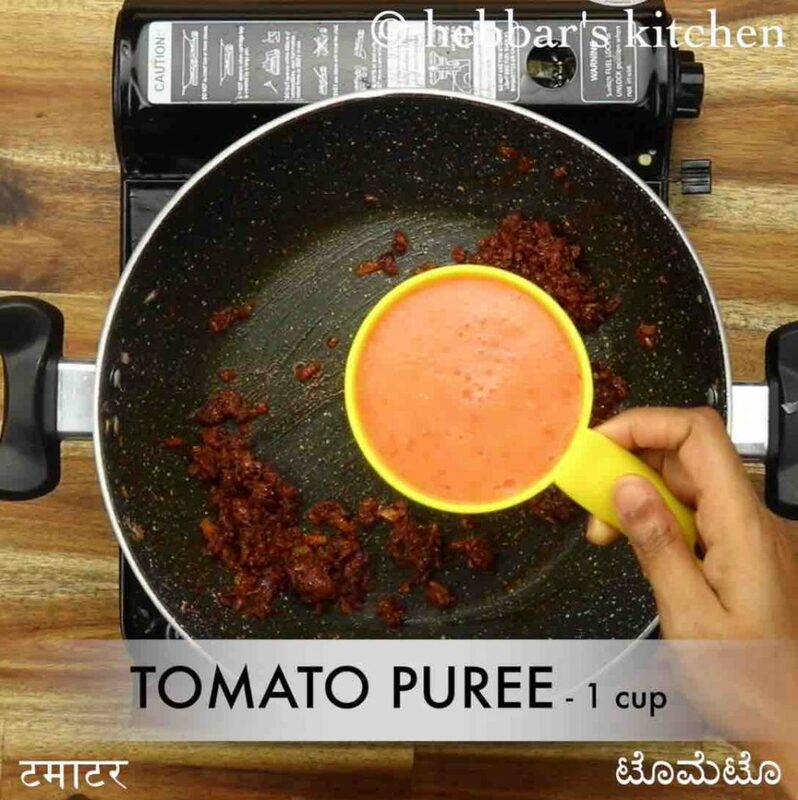 to prepare tomato puree, blend 3 ripened tomatoes in a blender. 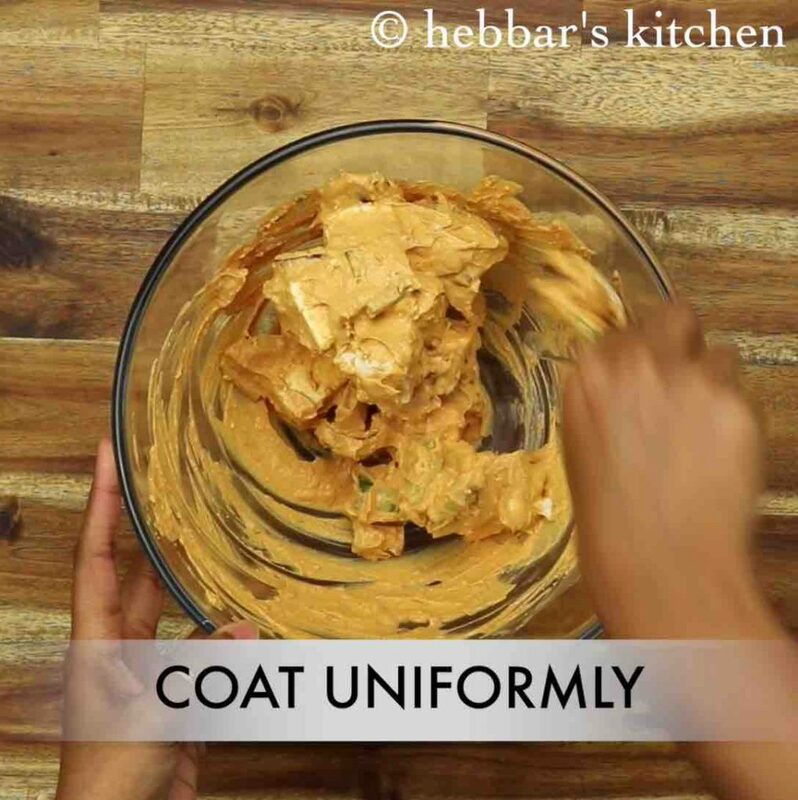 also, add ½ cup cashew paste and continue to saute. 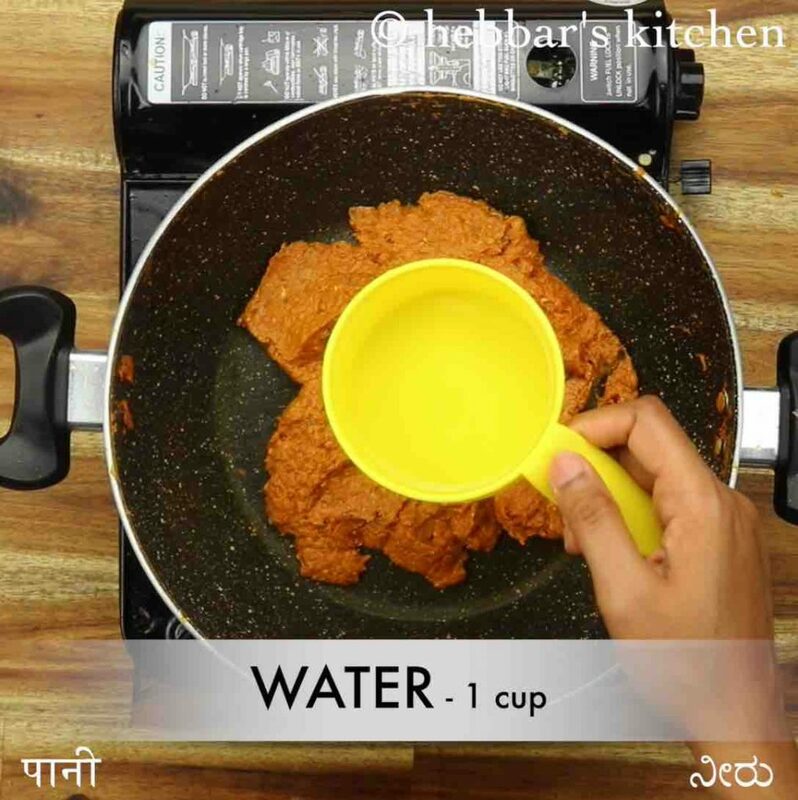 to prepare cashew paste, soak 10 cashews in ½ cup warm water. 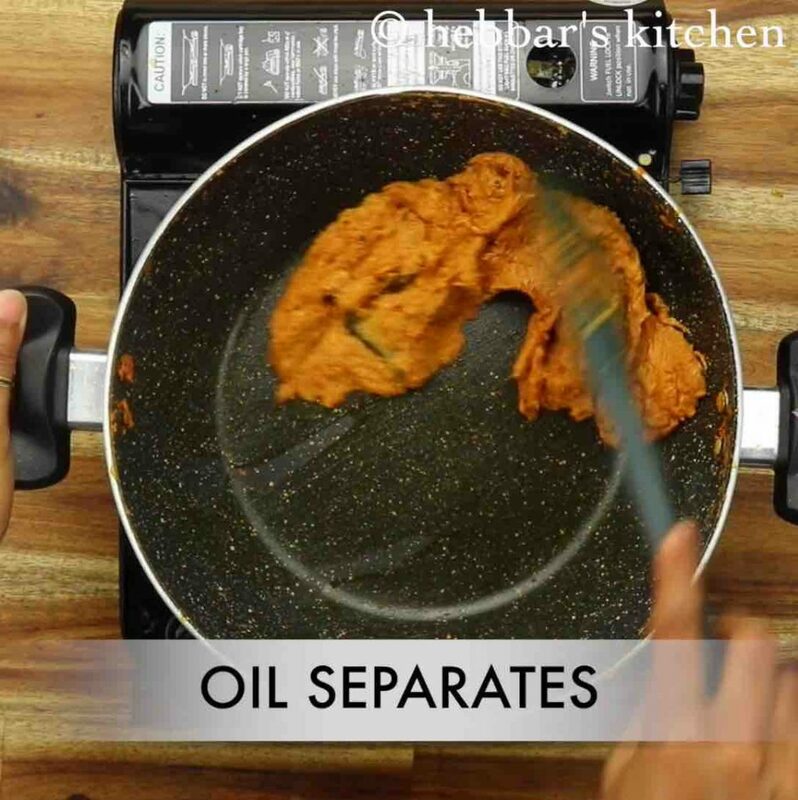 cook until the oil separates from sides. add in 2 tbsp coriander and 1 tsp kasuri methi. mix well. 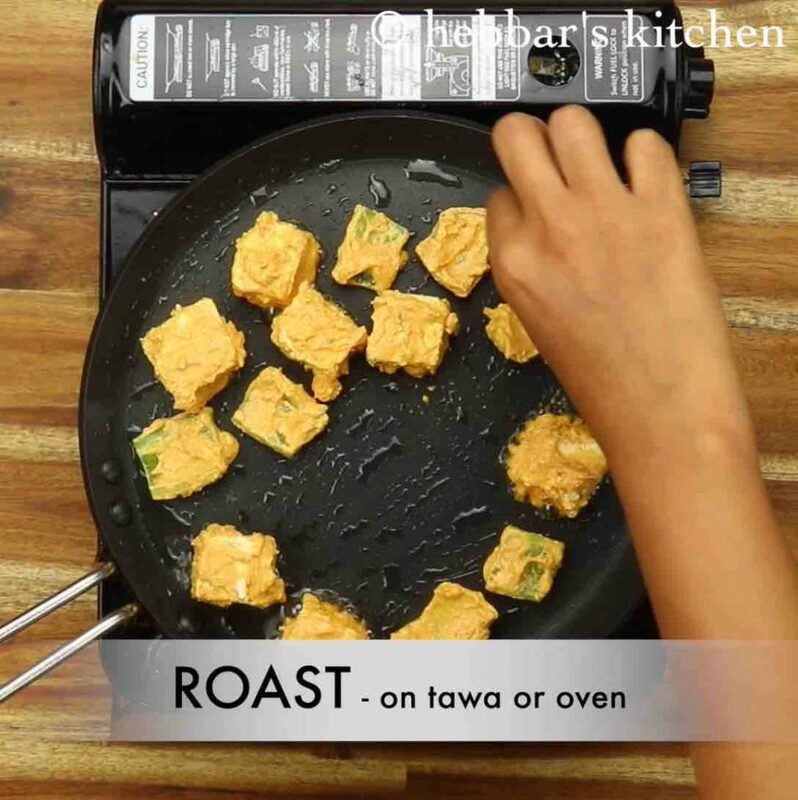 firstly, tikka can be prepared in oven or tandoor. 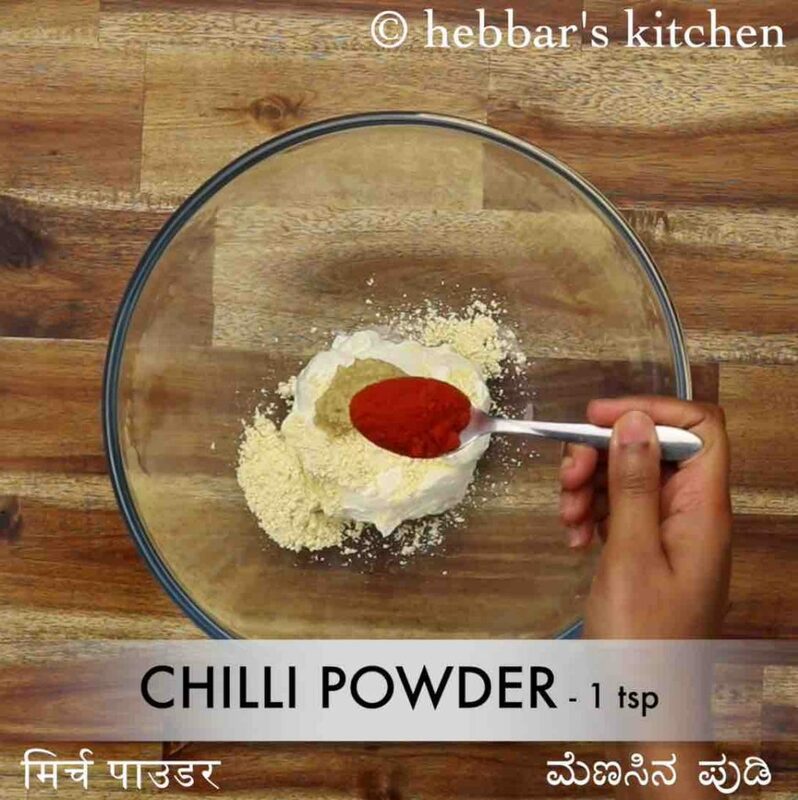 also, you can add tandoori masala powder or cream to make tikka masala flavourful. 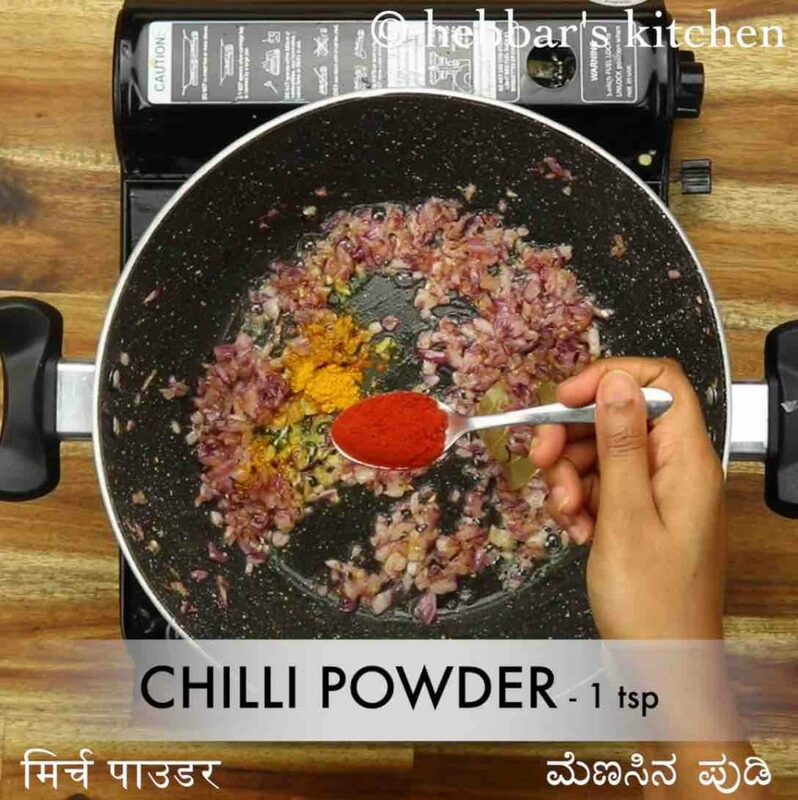 additionally, add red food colour to get dhaba style curry. finally, paneer tikka masala recipe tastes great when prepared slightly spicy.